In 1903, the newly-formed Eveleth School District found itself faced with a severe shortage of space. Its two wooden schoolhouses, the Spruce and the Fayal, could not accommodate the growing student population, so the school board proposed a large brick high school. Bonds were approved, and the site was selected in June 1904. Construction began that fall, and the building opened on September 5, 1905. At that time, the district has 36 teachers and 1000 students. The three-story $40,000 schoolhouse was Eveleth's first constructed of brick. It contained 14 rooms, including an assembly hall on the top floor that held 5000. A description of the building in the December 19, 1905, Eveleth Mining News said the high school had "left-hand light" that created "no shadows," and "double wardrobes with swinging doors [made] it possible for boys and girls to be separated during the taking off and putting on of wraps and leggings." The school also contained a sewing and cooking department, a library, the superintendent's office, automating heating regulation, programmed clocks and bells, sanitary drinking fountains, and inside and outside phone lines. The school was dedicated during a meeting of the Range Teachers' Association on November 10, 1905. Dr. Cyrus Northrop, President of University of Minnesota, gave the main address in the packed assembly hall. The Mining News reported that Mae Trezona and Henrietta Davis decorated the building and served macaroons and punch. 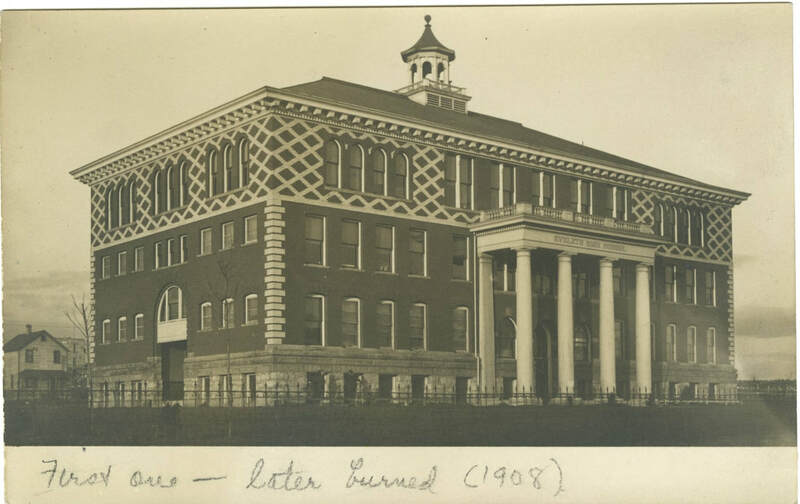 Eveleth High School on fire, June 26, 1908. Photos courtesy of Archives and Special Collections, Kathryn A. Martin Library, University of Minnesota Duluth. 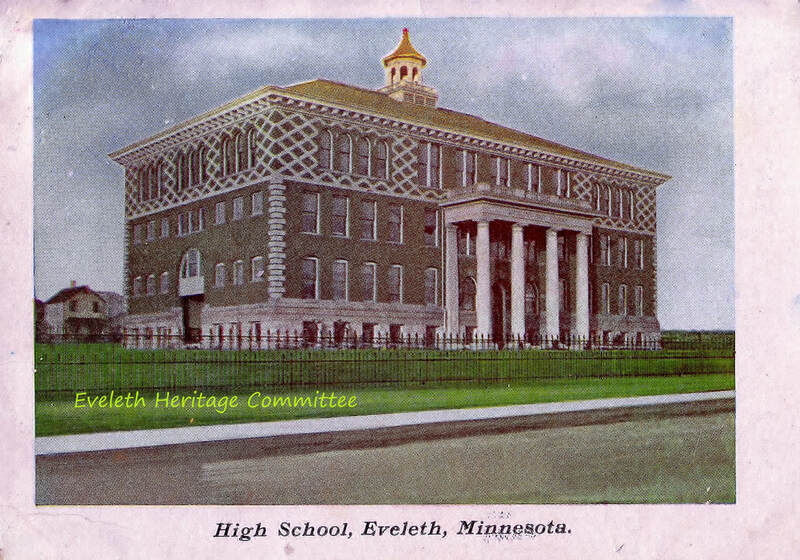 With sad hearts the people of Eveleth yesterday afternoon saw their beautiful high school, the largest and best building burn, from cupola to basement before their eyes with no hope of saving it. Fire was discovered issuing from the cupola at about a quarter of one by Andrew Anderson who turned in the alarm and by men at the Fayal mine who telephoned to the office. The fire department responded promptly enough but upon reaching the scene found themselves without ladders and there was a lack of leadership. Chief Neilon had just taken the train to Hibbing to see the Hibbing-Virginia ball game, and worst of all there was a lack of pressure that was all but maddening. Even had the department been prepared with ladders to reach the top of the portico which was obviously the best point of attack it is a question whether the progress of the flames could have been stayed at all with the puny streams emitted from the nozzles. Alderman E. H. Hatch, A. C. Anderson and Tom Harri finally gained an advantageous position on top of the portico and were doing good work against the flames which by that time had worked down from the roof to the third story for some unaccountable reason the water was turned off and they were forced to descend. Within a quarter of an hour it was evident that the building was doomed and attention was diverted to saving St. Patrick's church, the rectory, and other residences on Jackson street. The fire gradually conquered the magnificent school building floor by floor until the walls stood in bare and pathetic outlines against the sky, a considerable amount of books, cases, etc. was carried out though Supt. Greening gave orders that no one should imperil his life by going in for salvage purpose but the value was inconsequential. About three o'clock another call was accidentally turned in and the people were fearfully alarmed for fear of an outbreak elsewhere but their fears were found to be groundless. At no time did the department have more than 35 or 45 pounds of pressure at the nozzles. The cause is assigned by a member of the water board to changes in the steam connections made at the pumping plant by Supt. Vandall. ... The member of the water board holds otherwise and states that he with others remonstrated with Supt. Vandall against the change when it was being made. Supt. Vandall supports his contention that the piping change did not impair the efficiency by the fact that the pump was giving its maximum capacity of 450 gallons a minute. If the intake had been larger and the supply greater stronger pressure could have been secured by using the other pump. The plant and the connecting main with the old system was tested up to and above the 240 pounds against static and friction heads, as provided in the specifications, when the plant was accepted but this test was not in connection with the distributing system and a test of the whole system has never been made. Supt. Vandall also claims that the six inch main at the school was inadequate to carry the number of hose lines which were attached. When seen this morning Mr. Vandall said he wanted to have the whole matter investigated and there is also a popular demand for a public investigation of all the circumstances. Property owners in town want to know why the department started to fight the fire against the wind, why it was not prepared with ladders and if ladders were lacking why that fact was not reported to the city council. They also wish to learn whether it is possible to secure fire pressure at the elevation of the school. Mayor Smith is a strong advocate of securing a fire engine and it seems to be the general opinion that one should be bought at once. It has also been suggested that there should be more intersecting mains running to the north from the supply pipe. Furthermore, if the intake at the lake is inadequate to supply the two pumps at the same time, it ought to be enlarged. The two pumps are not supposed to ordinarily be running at the same time but the expectation was that they could be so used in case of emergency. The school destroyed was built in 1903-04 at an expense of $50,000 in round figures and with equipment of all kinds represents a loss of $90,000, partially covered by insurance. While the fire was still raging it was determined to rebuild at once. As Treasurer Dormer stated this morning there is no option in the matter. Whether it shall be exactly duplicated is a question that has been under consideration by the school board today. Architect [William T.] Bray has been here and visited the ruins. The school was the pride of the city and the center of all educational affairs. An incredible amount of work had been lavished on the various rooms during the past four years by teachers and pupils. The rooms had been decorated with works of art and furnished with all modern facilities. The board and Supt. Greening will find it difficult to provide place for the pupils while rebuilding is in progress. The insurance was of the blanket kind and was carried in 17 different companies. A total of $70,000 was carried on all the schools of the city, exclusive of the new grade school now building, and of this amount $40,000 applies on the high school. The division of the $70,000 insurance carried is as follows. The office of the superintendent has been transferred to the Fayal building, also that of the librarian and books may be returned there. Those who are to receive instruction during the summer term should report at the Fayal building at 9 o'clock Monday morning.